The “Sezione A.R.I. Mestre” issues a new permanent diploma called “Comuni del Veneto”. This diploma is free of charge and is issued only electronically in the format of a JPG or PDF file ( please specify which you prefer ) for contacts/heards with stations located in different Comuni ( Comune is the smallest administrative entity on the territory ). QSOs are valid from January 1, 2000. QSOs with /P or /M stations are accepted provided the QTH is stated on the QSL itself. eQsl are accepted. 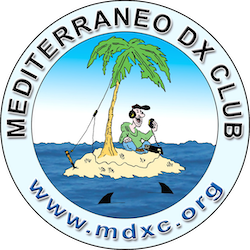 QSOs via repeaters are not allowed. 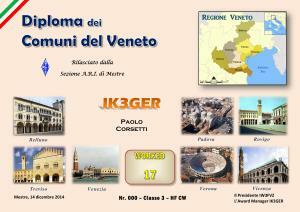 The Regione Veneto ( North East Italy ) is made up of 7 provinces ( a province groups more Comuni ). They are Belluno (ZIP 32xxx), Padova (ZIP 35xxx), Rovigo (ZIP 45xxx), Treviso (ZIP 31xxx), Venezia (ZIP 30xxx), Verona (ZIP 37xxx), Vicenza (ZIP 36xxx). In total there are 581 Comuni. You need 30 confirmations from Comuni located in at least 3 different Veneto provinces. The diploma may be issued in the usual endorsement of “CW”, “SSB”, “Mixed”, “RTTY”, “PSK”, “DIGIMODES”. QSL cards are not required but they must have been received by the applicant. In case of any doubt the award manager may request any QSL for verification. You can download a fac-simile of the application – GCR – from http://www.arimestre.it/diploma-di-sezione/diploma-comuni-del-veneto/english-2/ or you can make your own but respecting the main scheme with all needed details. The application should be emailed to the award manager IK3GER, Paolo, corsetti.paolo@libero.it .